Is Technology an Adjunct to Learning? 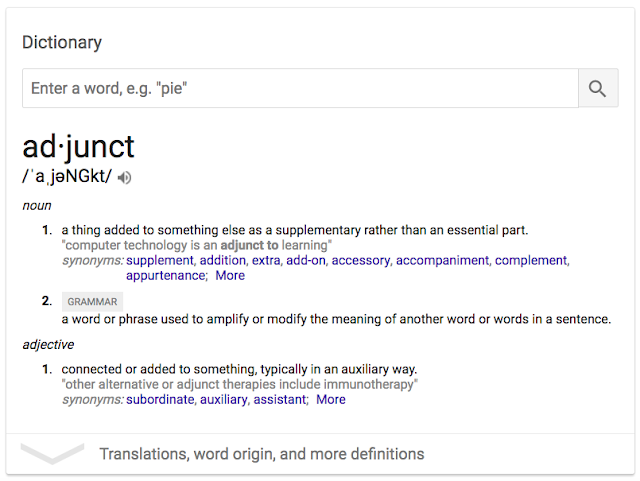 As a first-time adjunct professor at Marymount University, I thought it would be a clever idea to integrate the word, "adjunct" into my blog name, and also refer to it in my first blog post. What can I say, I'm a sucker for puns! After naming my blog, "The EdTech Adjunct," I decided to Google the definition of "adjunct" just to see what popped up. So, I typed in the following operator in the search bar, "define:adjunct" and this is what I saw. The definition read, "a thing added to something else as a supplementary rather than an essential part." This made me begin to think about our TPACK discussion from class on Friday. The TPACK model would argue that technology is as equally important as pedagogy and content knowledge with regard to teaching and learning. Therefore, how could technology merely be an "extra", or an "add-on" to learning if it is equally valued by the TPACK model. However, I noticed the second definition of the word "adjunct" which caught my attention. It reads, "a word or phrase used to amplify or modify the meaning of another word or words in a sentence." The words used in this definition reminded me of one of my favorite quotes on technology and learning from my good friend and colleague, George Couros. In his book, Innovator's Mindset, he wrote, "Technology gives us the power to accelerate, amplify and even recreate learning." George uses very similar words to describe technology that are found in the second definition of the word "adjunct" such as amplify, accelerate, and modify. So, this makes me question whether or not I agree with the following sentence given as an example for the word, "adjunct". "Computer technology is an adjunct to learning"
What do you think? Is technology an adjunct to learning? Would you agree or disagree with this statement?